Jews have lived in Rome for about twenty two centuries making it the oldest uninterrupted Jewish community in the world. They arrived the same year a bridge was built in 162BC, connecting the good side of the river to the side where the Jews were told to live. In fact, the Hebrew word for Jews, Evrim, means “over there”. At that time, the Jews were invited to Rome, sent by Judah Maccabi, and they soon had twelve synagogues. (Today there are four.) One hundred years later, when the Forums and Coliseum were built, the Romans needed people who could speak the six major languages (Greek, Latin, Persian, Egyptian, Hebrew and Aramaic), and who were famous for ethics to run a global network of trading posts. Corruption was so widespread at that time, someone was needed who could be trusted to handle business. The Jews fit the bill and a new bridge was built to give them access to these new markets. It was called the Ponse de Evrim, Bridge of Jews. In fact, in modern times, wherever diamonds are traded, you will find Jews involved because they have the same characteristics of trustworthiness as was needed in ancient Rome. Jewish life was never easy. For over nine hundred years, Jews ran the fish market in Rome. Since fish stank, that's where the Romans wanted the Jews. There are slabs of marble that still exist today from that time. The Jews wanted the marble on which to place ice to keep the fish fresh. The Stone Cold Creamery should pay these fish mongers a royalty for their ingenuity. In 1555 Pope Paul IV wanted to make life so miserable for the Jews that they would convert. He put them in a ghetto, separated from everyone else … 6,000 people in an area large enough for only 2,000. The word “ghetto” comes from “get”, a divorce, a separation. In 350 years only twenty Jews converted. Jews were forced to attend conversion sermons after the Sabbath, but unbeknownst to church officials, they put wax in their ears so they couldn't hear. Until Italy was liberated from the Pope in 1870, the Jews were only allowed to participate in three trades – silversmithing, money lending and the shmatta business (second hand clothes). Only Romans had temples, Jews had to pray in a scola, or school, which later became Shula and then Shul. In fascist Italy, Jews were not rounded up, but when the Nazis arrived 100,000 Jews seemed to disappear into thin air. The Christians hid them. The Great Synagogue which opened in 1904, was built on the landfill of the former Jewish Ghetto and is the second tallest structure in Rome. St. Peters is 450 feet high and the Great Syna-gogue is 350 feet, with a unique square dome made of aluminum … an engineering marvel. And the Synagogue itself is a marvel. In 1904 the King of Italy came to the Shul. In 1986, Pope John Paul II was the first Pope to enter a synagogue and walked arm in arm with the Chief Rabbi of Rome, Rabbi Toaff. Do take a tour of this remarkable holy place and the Jewish Museum as well. The history, the information, the stories, will leave you wanting to know more. We were fortunate to have Roy Doliner, author of Sixteen Secrets of the Sistine Chapel and discoverer of the original model of the Pieta by Michelangelo, as our guide. Contact his organization, Associazione Culturale Rome for Jews (info@romeforjews.com or email skychai36@yahoo.com) and ask for David Walden to arrange a Jewish tour when in Rome. You will not be disappointed. Be sure to ask about the mysterious K Syndrome that bamboozled the Nazis, how Jews hid five mini synagogues (one for each sect) in the one synagogue allowed in the 1500's, the olive tree from Israel in the front courtyard, Arafat's murder spree at the museum and how a bullet ridden bible converted a man to Judaism, and why the Nazi's didn't destroy the Great Synagogue when they occupied Italy. Next to the Jewish Museum is the place where Jews and locals meet to eat. 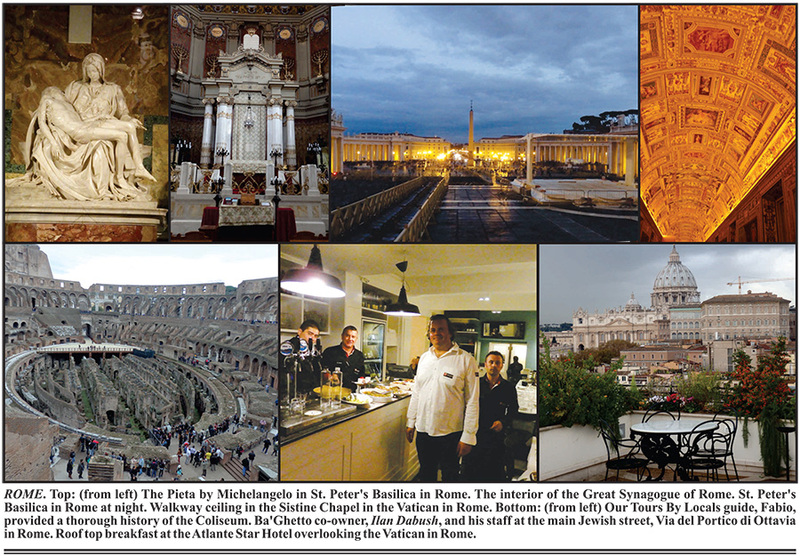 It is two blocks of kosher meat and dairy restaurants, bakeries, gelato and assorted shops including those from which the Pope and Vatican officials order takeout for their Jewish visitors. Over twenty years ago, Ilan and Amit Dabush opened Ba'Ghetto, the first kosher restaurant on the block. It was a hit and is now the “in” place for good Jewish food. We started noshing on fried Jerusalem artichoke, fried zucchini, a traditional antipasti of cold cuts, a pasta dish with lemon, basil, zucchini and pine nuts and fresh and flavorful baccala. We enjoyed their cake with cherry marmalade and the mint tea with peanuts was fabulous. Among the dignitaries visiting Ba'Ghetto and the other Jewish restaurants on the block are the Pope, Burlesconi, Sarah Jessica Parker and Matthew Broderick. In Rome we stayed at the Atlante Star Hotel which is walking distance to St. Peters and the Vatican. The Atlante Star Hotel also offered a three hundred sixty mmmmnnnnmmm continued on next page continued from previous page mmmmm degree roof top view which, in warm weather, is perfect for complimentary breakfast and an extra cup of coffee. They also offered free pickup service from the airport. It is a clean no frills hotel with many English speaking guests. The décor was quite unorthodox but the bed was comfortable and the staff accommodating. In Italy, good tour guides are essential for a great vacation experience. We were blessed with knowledgeable and friendly people that were equal parts teacher, great story tellers, accommodating and able to fit so much into each day we felt that we really did get a great overview of history, culture and a sense of the people. Tours By Locals was wonderful in piecing together a great itinerary and helping us navigate between cities. Their local guides can book up months in advance so make your arrangements early. Toursbylocal.com worked around our heavy schedule in Rome, Tuscany and Florence (they cover all of Italy and other countries as well). Fabio Leotta was full of energy and when he met us at the Atlante Star Hotel on a Saturday afternoon, with certain sites closing early, we were delighted that he was able to show us around the Coliseum, the Sistine Chapel and Saint Peters and still have time for a cappuccino before closing time. Imagine an outdoor stadium built for 55,000 to 75,000 people where one could see gladiators fighting each other to death, slaves and Christians being stalked by lions and tigers and bears, plus assorted other entertainment, all for free. Welcome to the Coliseum built between 70-80 AD presumably was meant to keep people's attention from how miserable their lives were compared to their rulers who lived in opulence. To understand the brilliance of the structure one needs a guide, such as Fabio, who can arrange to bypass long lines (or a guidebook that shows how the Coliseum used to look and function). There was a genius in the creation of multiple elevators operated by hand bringing wild animals from underground to ground level where the deadly games took place. Words are inadequate to describe the Sistine Chapel. When one considers that Michelangelo preferred sculpting to painting, one could only marvel at his talent. (In fact, there is only a single painting attributed to him, an oil and tempera on a round panel depicting the Holy Family or Doni Tondo, and it is in the Uffizi Gallery in Florence.) The ceiling was painted from 1508-1512 for Pope Julius II and was literally backbreaking labor. It features the creation of man, original sin, expulsion from the Garden of Eden and the sacrifice of Noah. The side panel frescos were by artists such as Botticelli, Peregrino, Ghirlandaio and were completed by Michelangelo who worked seven years, from 1534-1541 on them and on one of his greatest achievements, The Last Supper (for Pope Paul II). The viewing experience is simply spellbinding, and thanks to Fabio, much easier to appreciate. Italy afficionados will tell you that Tuscany has so much to offer that an entire vacation can be spent touring that area alone. We had two days. If you have a great place to stay, and a wonderful guide for the surrounding area, the result will be a memorable experience. 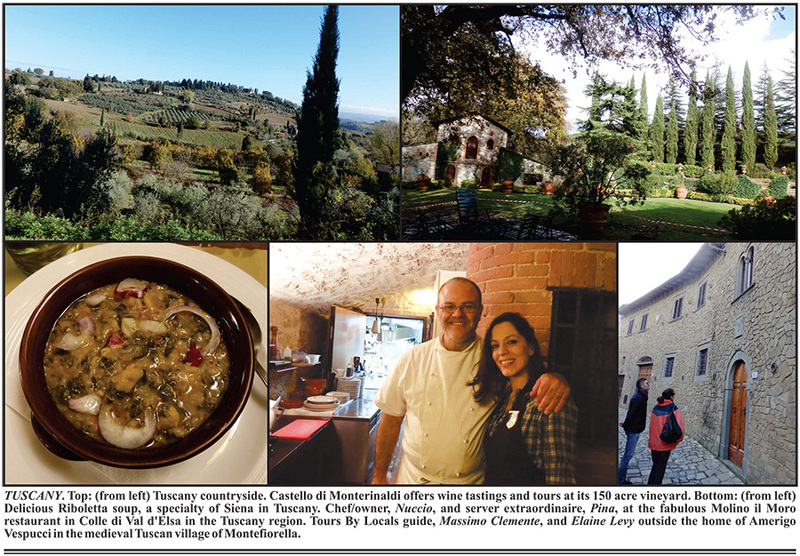 We were fortunate that Massimo Rossinelli, CEO and GM of the Ross Hotel Group, offered to host us at one of his four charming hotels in the Chianti region of Tuscany. Each property is very special, building on the history of the area. Their first, L'Ultimo Molino was an old mill from the 1100's. Then they renovated a medieval palace and most recently created Palazzo San Lorenzo in Colle di Val d'Elsa, halfway between Siena and Florence. The Palazzo, which had been a hospital for three hundred years until 1999, was beautifully renovated and opened in 2010. They offer spa packages, meeting rooms, holiday celebrations, private parties and all the amenities for their many visitors from Italy and abroad. The restaurant's chef makes dining a pleasure and their ample breakfast, which includes specially prepared treats (such as warm almond flaked biscotti) is a wonderful way to start the day. The rooms are extremely comfortable and the staff is attentive and helpful. As with all the Ross Hotels, day trips and special activities can be arranged either specific to individual desires or as part of a group, to enjoy all that Tuscany has to offer. Colle di Val d'Elsa is memorable for our finest dining experience in Italy. Just a ten minute walk Palazzo San Lorenzo, on a cobblestone street, passing castle walls of a bygone era, downstairs in a picturesque grotto is Molino il Moro at Via della Ruota,2. A fine bottle of local wine for twelve euro was superb. The pasta dishes were delectable … thin Tagliatelle with fresh truffle and large ravioli with wild boar ragout. They served four types of fresh breads with top quality olive oil. The grilled chicken was excellent as were the meal ending deserts. The chef/owner Nuccio was very gracious and proud of his restaurant and the server, Pina was a delight. The town also features the country's largest crystal factories, which produce 85% of Italian lead-glass crystal and 15% of the world's supply. It is also about half hour from Siena, a picturesque walled city at an elevation of 1,000 feet. One can get pleasantly lost traversing all the side streets loaded with shops and places for a cappuccino or lunch. We enjoyed a favorite local dish, riboletta, a hearty soup topped with grated cheese and olive oil. Yum! The best way to appreciate Tuscany is to have a friendly and knowledgeable guide. We lucked out again with Tours by Locals when they recommended Massimo Clemente. We had a lovely sunny day to stroll around San Gimignano, built in the 1300's, high atop a place known as the City of Towers. Towers were a symbol of wealth and there were once seenty five of them here with a population of 10,000.Now there are thirteen towers and 1,300 people, with 50% employed in tourism and many others in the world renowned wine region where names such as Chianti, Brunello, Sasikaya come to life. There are two hundred forty eight certified wineries in the Chianti region alone employing many foreign workers, mostly from Senegal, Morocco and Tunisia for six to seven months a year, who then remain as illegals which is a strain on the education and health systems. Romanians and Albanians populate the construction industry. We walked through the medieval village of Montefiorella in fifteen to twenty minutes … the birthplace of Amerigo Vespucci and Lisa (Gherardini) Giocondo, the model for the Mona Lisa. Massimo had a wonderful surprise in store for us at the Castello di Monterinaldi, a villa from the early 1800's and now one hundred fifty acres of vineyards. It is a midsize winery that produces 100,000 bottles a year. We had a private tour and tutorial which culminated in a private lunch prepared by the owner's personal chef, which included a wine tasting that we will long remember. As hard as it was to move on from Tuscany, when Massimo drove us to a perfect spot overlooking Florence, the Piazalle Michelangelo, we knew more excitement was in store for us. I've always had a special spot in my heart for Florence (the city, not the girl). 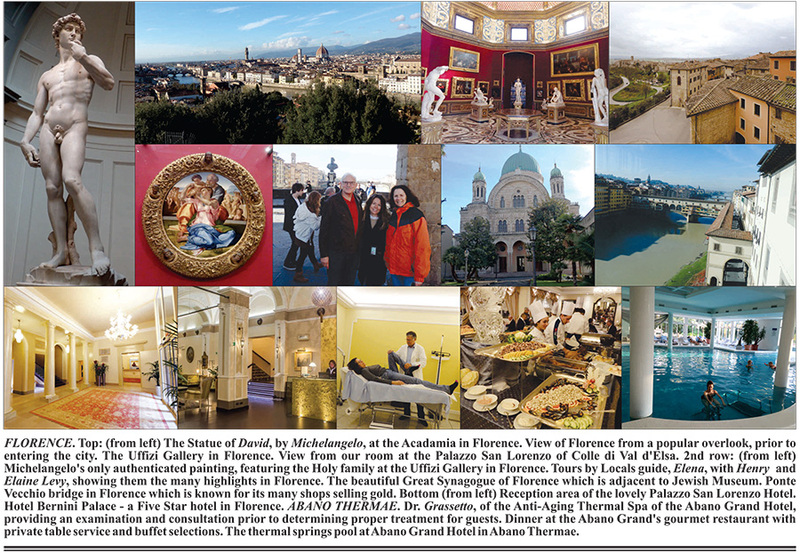 Perhaps it was “The David”, “Dawn & Dusk”, Ghiberti's Bronze Doors or the river views, but it was class, culture and beauty … a winning combination. Now we had two additional advantages – a wonder-ful hotel, the Hotel Bernini Palace and a knowledgeable guide, Elena Calissi from the reliable Tours By Locals company. The Hotel Bernini Palace was perfect for us. It is just minutes from the major shopping streets and the Santa Croce Church with the tombs of Galileo, Michelangelo and Machiavelli. The staff was welcoming and helpful and the room was luxurious and comfortable with all the amenities. Enjoy a coffee or drink in the lounge and unexpectedly delicious treats appear to accompany them. Every morning a sumptuous breakfast is available to get the day started on the right foot. The real stars appear throughout the city. The Academia is a marvel even if one only viewed the Statue of David, a seventeen foot tall masterpiece by Michelangelo. We were transfixed by the beauty of David holding his slingshot and rock just prior to his triumphant fight against Goliath. David is depicted as the perfect image of a twenty five to thirty year old man, rather than a sixteen year old boy. The Uffizi Gallery offers the greatest collection of Italian paintings including Botticelli's Birth of Venus (1482), Leonardo di Vinci's Annunciation of Jesus and Michelangelo's only authenticated painting, showing the Holy Family. Just past the Santa Croce Church is a leather school, Scula du Currio, originally run by Franciscans using young orphan workers. One can purchase the works of the students or even sign up for a day class and make your own belt, book cover, etc. It has been a workshop since 1932, and today, two sisters, Lauren and Francesca keep it functioning. The Jewish community, which dates back to 1870, could be found in the Plaza de Republica. Our guide provided the history and showed us all the important sights in the Jewish quarter. Ponte Vecchio bridge hosts goldsmith shops and is the gateway to the Pitti Palace as well as an array of shops and restaurants. For a great gelato, the Gelaterria Vivoli, one of the oldest in Florence, is highly recommended. One of our most surprising discoveries was the town of Abano Thermae, near Padua. There are over one hundred hotels, each one a thermal spa using the mud treatments that have made this area magnet for over 400,000 people a year and for Europeans for 2,000 years. They come to treat chronic pain and detoxify the body. Our stay at the Five Star Abano Grand Hotel was a trip back in time to a world of elegance and grandeur that included the comfort of the full spa experience. Imagine a stately exterior, Louis XV style lobby, spacious rooms where you feel like a VIP, superb staff, and your own designated table in the dining room for all your meals attended by a wait staff in dinner jackets and tuxedos. The buffet breakfast left nothing to be desired. Lunch and dinner provided a choice of dishes plus table after table of side dishes, salads and mmmjjmjjjjmmm continued on next page continued from previous page mmmmm desserts. The weekend dinner seafood buffet was especially delicious giving us an even greater appreciation of authentic Italian cuisine. The real star was the Anti-Aging Thermal Spa itself … specifically the world famous, therapeutic mud fango treatments. While many Americans may be new to these treatments, they have been drawing vacationers from all over Europe. Once you try it, the invigorating effect on your body compels you to make this a mainstay of your regime. We were feeling a bit exhausted, fighting off a cold upon arrival but after just one day of the fango treatment, jasmine massage therapy, inhalation therapy and steam rooms, the toxins seemed to dissipate from our bodies leaving us refreshed and good as new. The wonderful indoor/outdoor pools heated from the natural hot springs were worth every minute we spent there. The GB Thermae Hotel chain in Abano includes five different venues, each with its own specialty, and to decide which one best suits you, please see their website, www.gbhotelsabano.it. Each segment of our Italian sojourn seemed to build to a crescendo of satisfaction and fulfillment. Thus our final destination, Venice, was the perfect way to cap a spectacular Italian adventure. If one had to choose a perfect hotel to capture Venetian glory, it would be the Bauer Il Palazzo Hotel, with each of its five stars so well deserved. They made us feel like royalty, arriving by water taxi and taken to an elegant room with canal views that were simply breathtaking. Whatever image one may have of the ideal Venetian destination, the Bauer Il Palazzo seems to exceed it. Then there was the added bonus of rooftop dining for a sumptuous breakfast. Just outside the Bauer are the world class stores with all the brands women, and men everywhere love. 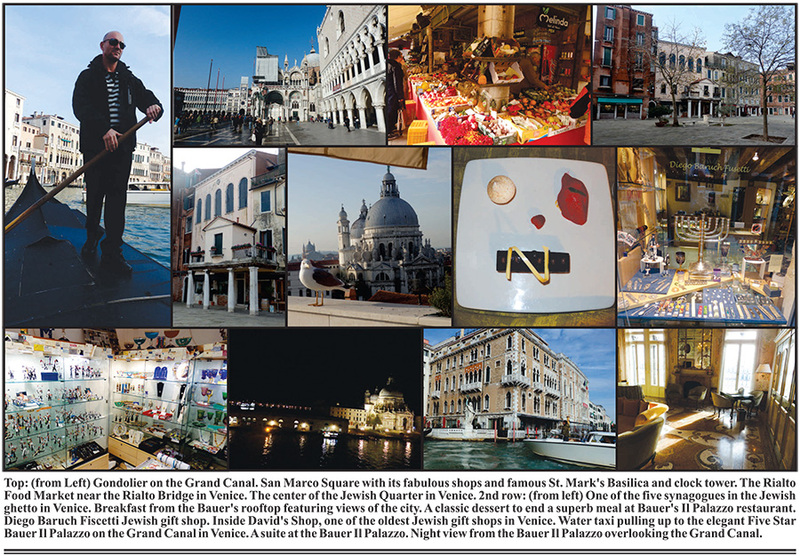 It is also just a few short streets to San Marco Square, bustling with people, shops and often entertainment. One thing to bring to Venice is comfortable walking shoes. To see the city one walks, and to see it well, arrange for a guide from Walks Inside Venice. Sara Cossiga, our guide is an art historian, certified sommelier and cheese taster. Her partner Roberta Curiel, has a degree in art history, is a specialist in foreign languages and author of “The Venetian Ghetto”, a book about Venice's Jewish history and synagogues. Let them know your passions and they will design a memorable customized walking tour of Venice. We enjoyed the Rialto food market and views from the Rialto Bridge as well as, the history and shops in the Jewish quarter and of course, the shopping. We gained an appreciation of the museums, art, culture, history and the canals with the gondola rides. Whether it was detailed descriptions or an overview of the key sites, Sara guided us around and time seemed to fly. Venice was a maritime republic and a military power consisting of 80% water and 20% land. The population in the 1930's was 157,000 and now it is 57,000. Only about two dozen Jews out of the small population of five hundred live in the Jewish quarter today. They originally had the same trades as early Roman Jews but some would say with better scenery. The Garden of the Finzi Contini's was based in Venice. If one has extra time to spend, the Islands of Burano (for lace) and Murano (for Venetian glass) are recommended. Find out when the festivals take place and you may find yourself enjoying Carnivale wearing one of the beautiful masks created by the artisans and available everywhere as a keepsake to bring home. We were told that those visiting Italy in the summer would face large crowds and long lines so if you want more elbow room consider other options. November worked out just fine for us. Prior to our trip, whenever we mentioned our plans to visit Italy, so many of our friends often related in glowing terms their multiple visits and which places they wanted to see yet again. We took that a satisfying vote of confidence for our decision to go and now we understand that it was all well deserved. Now back at home, each glass of Chianti Classico we drink or plate of delicious pasta we eat just make the memories fonder.